In the sitting room of the Alphaeus Barbour House at the Barbour Living Heritage Village in Newfoundland, the window is opened to the outside world. This historic village lets visitors explore the lives of the Barbour family that spent their days sealing and fishing in Newfoundland and Labrador. The Barbour House is just one of many historic buildings in the village that is surrounded by small harbours and channels. Looking out the sitting room window of the Alphaeus Barbour House at the Barbour Living Heritage Village, Newtown, Bonavista Bay, Highway 330, Road to the Shore, Newfoundland, Newfoundland Labrador, Canada. 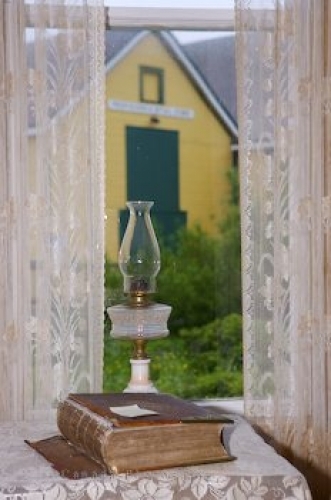 Picture of a window at a historic house at the Barbour Living Heritage Village in Newfoundland.